Shopping for Power Rangers Statues? The Green Ranger comes to the Figuarts ZERO statue line! Amazing and highly detailed statue of the Green Ranger, Dragon Dagger in hand. Imported from Japan. From Bandai Tamashii Nations. From the Mighty Morphin Power Rangers, Tamashii Nations is proud to announce the release of the great Green Ranger! 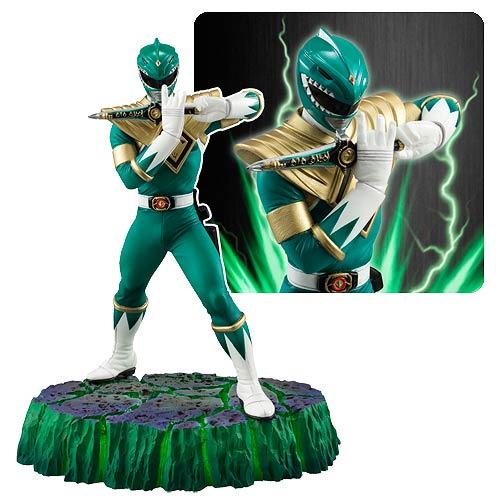 He is the first Ranger to make his debut in the Figuarts ZERO statue series, portrayed in splendid detail from his armor down to the vivid green coloring in the dynamically cracked earth display base. Green Ranger is impressively posed, holding his trusty Dragon Dagger as a flute just as he summons the mighty Dragonzord! Measures approximately 7-inches tall. Click here for the full story. Ages 15 and up.